Metrics Technologies is the first EDA platform provider of cloud-based SystemVerilog simulation and verification management, accelerating the move of semiconductor verification workloads into the cloud. 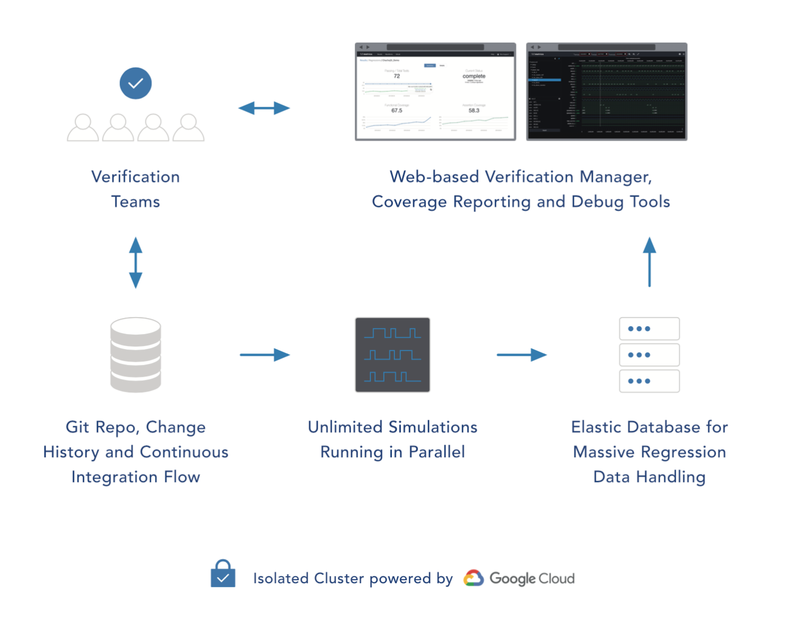 The Metrics Cloud Simulator and Verification Manager, a pay-by-the-minute software-as-a-service (SaaS) solution built entirely on GCP, improves resource utilization and engineering productivity, and can scale capacity with variable demand. Simulation resources are dynamically adjusted up or down by the minute without the need to purchase additional hardware or licenses, or manage disk space. You can find Metrics news and reviews at www.metrics/news.ca, or schedule a demo at DAC 2018 at www.metrics.ca. Elastifile delivers enterprise-grade, scalable file storage on Google Cloud. Powered by a high-performance, POSIX-compliant distributed file system with integrated object tiering, Elastifile simplifies storage and data management for EDA workflows. Deployable in minutes via Google Cloud Launcher, Elastifile enables cloud-accelerated circuit design and verification, with no changes required to existing tools and scripts. NetApp is a leading provider of high-performance storage solutions. NetApp is launching Cloud Volumes for Google Cloud Platform, which is currently available in Private Preview. With NetApp Cloud Volumes, GCP customers have access to a fully-managed, familiar file storage (NFS) service with a cloud native experience. Quobyte provides a parallel, distributed, POSIX-compatible file system that runs on GCP and on-premises to provide petabytes of storage and millions of IOPS. As a distributed file system, Quobyte scales IOPS and throughput linearly with the number of nodes–avoiding the performance bottlenecks of clustered or single filer solutions. You can try Quobyte today on the Cloud Launcher Marketplace. If you’d like to learn more about EDA offerings on Google Cloud, we encourage you to visit us at booth 1251 at DAC 2018. And if you’re interested in learning more about how our Hardware Engineering team’s used Synopsys VCS on Google Cloud for internal Google workloads, please stop by Design Infrastructure Alley on Tuesday for a talk by team members Richard Ho and Ravi Rajamani. Hope to see you there! A popular enterprise use case for Google Cloud is electronic design automation (EDA)—designing electronic systems such as integrated circuits and printed circuit boards. EDA workloads, like simulations and field solvers, can be incredibly computationally intensive. They may require a few thousand CPUs, sometimes even a few hundred thousand CPUs, but only for the duration of the run. Instead of building up massive server farms that are oversubscribed during peak times and sit idle for the rest of the time, you can use Google Cloud Platform (GCP) compute and storage resources to implement large-scale modeling and simulation grids. Our partnerships with software and service providers make Google Cloud an even stronger platform for EDA. These solutions deliver elastic infrastructure and improved time-to-market for customers like eSilicon, as described here.